Mathew Minton was born in 1967, is of the Mantitltjarra language group, and belongs to the Tjampitjinpa skin group. 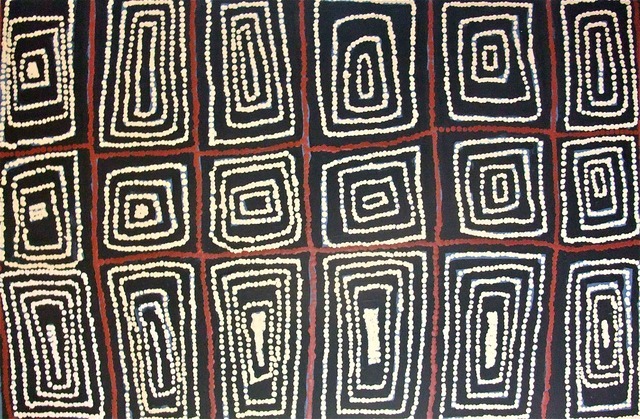 He began painting recently and works alongside his wife, who is an astablished artist in Tjukurla, the home of Tjarlirli Art. He paints stories of the Pilbara area, the country where he grew up. Cotton Creek: In the Cotton Creek area north of Kintore (in the Northern Territory, near the Western Australian border), there are three well-known rockholes and creeks where people go to to collect water and all kinds of bush tucker. In this work, Minton depicts the four directions where his grandmother, grandfather, father and mother came from converging at a sacred rockhole.